Keyboardist and synth-man Jason Miles is back with his latest album in tribute to the late, great saxophonist Grover Washington Jr. Recorded live at the Blue Note in Tokyo Japan, Miles has delivered one of the best jazz albums of the year. As we wrote nearly a year ago, you might not recognise the name Jason Miles but it’s likely that you are familiar with some of the music he has helped create as one of the most in demand session musicians of the past three decades. Miles has worked with nearly them all: Miles Davis, Michael Jackson, Luther Vandross, George Benson, Marcus Miller – in fact, you name it, Miles has probably worked with them at some point. He’s also released several well-received albums of his own, including last years Kind of New, a quasi-tribute to Miles Davis, with whom he worked in the eighties on the album Tutu. 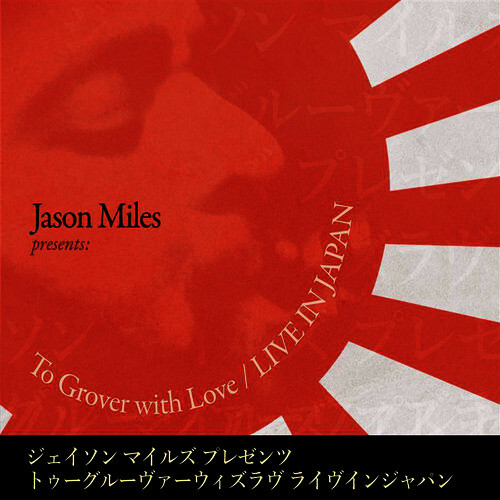 Now he’s released a live album in tribute to Grover Washington Jr recorded at the Blue Note in Tokyo in 2010, the third album in honour of the great saxophonist Miles has released. It’s been nearly seventeen years since the death of Washington, who died quite suddenly at the age of 56 after collapsing after recording a performance for The Saturday Early Show on CBS in America. And it feels that Washington is, bar the repeated spins of his classic ballad ‘Just The Two of Us‘ with Bill Withers on commercial radio, beginning to be somewhat forgotten in the mainstream. Which, given Washington’s incredible success as a musician and solo artist, is a shame. Washington was one of the best to ever strap a saxophone around his neck, and one of the most creative jazz artists to record. It’s this legacy that Jason Miles seeks to continue on his latest release. According to Miles in the linear notes of the album, he fell in love with Washington’s sound in college after buying the Inner City Blues album, an all instrumental affair with Washington putting his unique spin on classics such as Marvin Gaye’s Inner City Blues and Mercy Mercy Me, along with Bill Withers’ Ain’t No Sunshine. After following Washington’s career closely through Mr Magic and Winelight, among others, Miles got the chance to work with the man himself. He remembers Washington as being “the consummate professional who always brought a smile and a great vibe to the session or the gig“. Now with tribute albums we find they’re usually done in three ways: brilliantly, awfully or a bit, well, meh. We’re glad to report that To Grover, With Love Live In Japan fits firmly in the first category. The musicianship is stellar, the selection of tunes is inspired, and the sound is stunning. Let’s start with the musicianship. Paying tribute to someone so unique as Washington is always going to be a challenge; musicians like him have their own sound that you recognise as soon as you hear that first note. Wisely, Miles and his band of crack musicians make no attempt to merely recreate Washington’s catalogue on stage, instead using their own creativity to breathe a new lease of life into these well-loved tunes. The band featured two saxophonists, Andy Snitzer and Eric Darius, who both do justice to Washington, sounding funky yet sweet throughout. The rhythm section of Buddy Williams on drums, Nick Moroch on guitar and Gerald Veasley on bass combine to create a real funky sound, topped off with the maestro Jason Miles on Fender Rhodes. The band is topped off with none other than musical royalty with Ralph MacDonald, a lifelong collaborator with Washington and countless others in jazz-fusion and star in his own right. This would be one of MacDonald’s last performances before he too passed away, but the man still had it; his percussion on ‘Let it Flow‘ is outstanding. The selection of songs by Miles to perform live is pretty much bang on. The album charts Washington’s career as a jazz innovator, from Inner City Blues to Winelight to Just The Two of Us. There’s no low-point on the album, each song is performed brilliantly by Miles and his stellar band. If anything, they seem to have added some more welcome funk to Washington’s back catalogue, helped in part by Veasley’s incredible bass playing. He really turns it on with his solo on ‘Let It Flow‘. Ryan Shaw, a singer from Georgia, handled the vocals on ‘Just The Two of Us’, doing a fine job covering what is a classic vocal from Bill Withers. Miles didn’t need to choose this for the album, but in selecting ‘Just The Two of Us’ reminds us of what an incredible song it is: sure, it’s overplayed, but if you listen to the full seven-minute version, it’s pure joy. To Grover, With Love Live In Japan is a stunning album in tribute to one of the great men of jazz. Jason Miles has given us a real gift with this album – reintroducing us to the work of Grover Washington nearly two decades after his passing, at a time when perhaps Washington is being somewhat forgotten in the industry. Yet as this album proves, Washington was one of the innovators in jazz in the second half of the last century, up their with Miles Davis and the rest. Miles and his band produced some real magic that night in Tokyo, and now thanks to the small label WhalingCity Sound we are all able to share in this musical delight. Jason Miles Presents To Grover, With Love Live In Japan is out on Whaling City Sound now and is available on iTunes and Amazon. To learn more about Jason Miles you can read out in-depth article here.